Consistently producing milk of a high quality; it all starts on the farm. We encourage our farmers to let their cows graze in the fields. In addition to grass, the cows eat corn and concentrates. Our farmers give the best care to their cows. The better a cow feels the more milk it gives: on average about 25 liters per day. The dairy farmers commit to an increasingly sustainable agriculture, with lower energy consumption and fewer greenhouse gas emissions. More than 700 dairy farmers participate in a program to place solar panels on their stables with which they generate energy for their own farm and for the environment. Besides that, the health and welfare of the cows and taking care of biodiversity (flowers, birds, insects) are also important aspects of our sustainability program. The farmer stores the milk in a cooling tank at 4°C. The milk then goes to a factory in a refrigerated truck. By doing this, the quality and taste of the milk is preserved. The driver of the milk truck carries out a quality check and transports the milk from the farm to the factory. Milk trucks with the FrieslandCampina or Campina logo can be seen throughout the Dutch countryside. More and more of our trucks are equipped with solar panels or special tanks containing a mixture of diesel and gas (LNG). The use of bio-waste as fuel is also being tested. By working with alternative fuels, we can reduce greenhouse gas emissions by as much as 12%. The milk is processed into a dairy product as soon as the it arrives at a factory. Milk is used in yoghurt, cheese, butter, cream or desserts. Or we change them into ingredients for other food makers. The quality and safety are guaranteed by employees of quality services who work with international standards. We also aim to reduce energy (2% less per year) and water every year during the production processes at the factory. The waste is separated and in many factories the waste water is cleaned. In 2020, all FrieslandCampina sites must use 100% renewable electricity worldwide. For example: from sun, wind or biomass, and as much as possible from our own farms. For each factory, objectives have been set to consume less energy and water. Our products and packaging are made from responsible raw materials such as soya, cocoa and palm oil. Our experts research and develop the unique composition and properties of milk every day. By doing this we see the bigger picture and gain more insight into the nutritional value of milk, and what it does for us at all stages of life. Our researchers are committed in making new products or new applications for ingredients from milk. They’re also working on new sustainable packaging and better production processes that require less energy or water. The FrieslandCampina Institute provides information about dairy, food and health for professionals who work in healthcare. Milk is naturally a source of nutrients: proteins, calcium, phosphorus, iodine, potassium and vitamins B2 and vitamin B12. This makes it part of a balanced diet and part of a healthy diet and lifestyle. 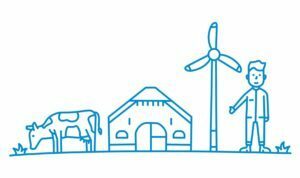 Dairy farming in the Netherlands is doing well compared to other countries when it comes to the impact on the environment. The environmental impact of Dutch dairy farms is the lowest in the world.